Rob Bowker's post about teleprinters reminded me of another very interesting entry in my January 2, 1904, copy of Collier's magazine (yes, Georg, someone in the US was kind enough to think of me 107 years ago, as they were 10 days ago with the Winsor!). In its centrespread, Collier's ran "A Pictorial Review of the Princiapl Events of 1903". The above photograph was included. 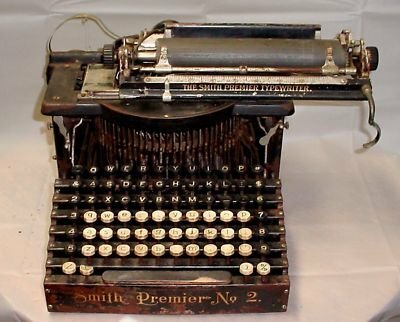 Is that a Smith Premier No 2 I spy in the bottom right corner? Of course, a typewriter would have to get in on the act on such an important occasion. 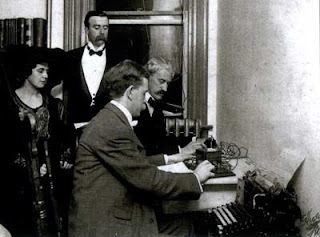 The History of the Atlantic Cable & Undersea Communications website (http://www.atlantic-cable.com/CableCos/ComPacCable/0) has a much better photo of the moment - and the typewriter. The caption reads, "July 4th, 1903 - sending the round the world message via the Commercial Pacific Cable system from Theodore Roosevelt's home at Sagamore Hill,Oyster Bay, Long Island, New York. Clarence Mackay [Commercial Pacific Cable Company president] standing, Katherine Mackay to his right." The "Governor Taft at Manila" referred to in Collier's caption was William Howard Taft, who, at the time of receiving the cable, was battling amoebic dysentery, something about which "the members of his family in the United States were seriously alarmed; so were President Roosevelt and Secretary of War Root." 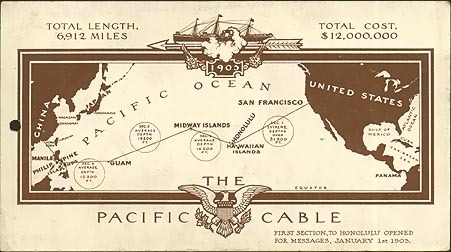 Wikipedia tells us: "Commercial Pacific Cable Company was founded in 1901Commercial Pacific Cable Company was founded in 1901Commercial Pacific Cable Company was founded in 1901 and ceased operations in October 1951. It provided the first direct telegraph route from America to the Philippines, China, and Japan. "The company used cable ships to lay its undersea cable across the Pacific Ocean from America's west coast. The cables extended a length of 6912 miles and the project cost about $12 million. Before this, messages had to travel across the Atlantic to the Far East via Cape Town and the Indian Ocean, or via London to Russia, then across the Russian landline to Vladivostok, then by submarine cable to Japan and the Philippines. "The first section of cable was laid in 1902 by the cableship Silvertown from Ocean Beach, adjacent to the famous Cliff House in San Francisco, to Honolulu. It began operating on January 1, 1903. Later that year, cables were laid from Honolulu to Midway, then from Midway to Guam, and then from Guam to Manila. 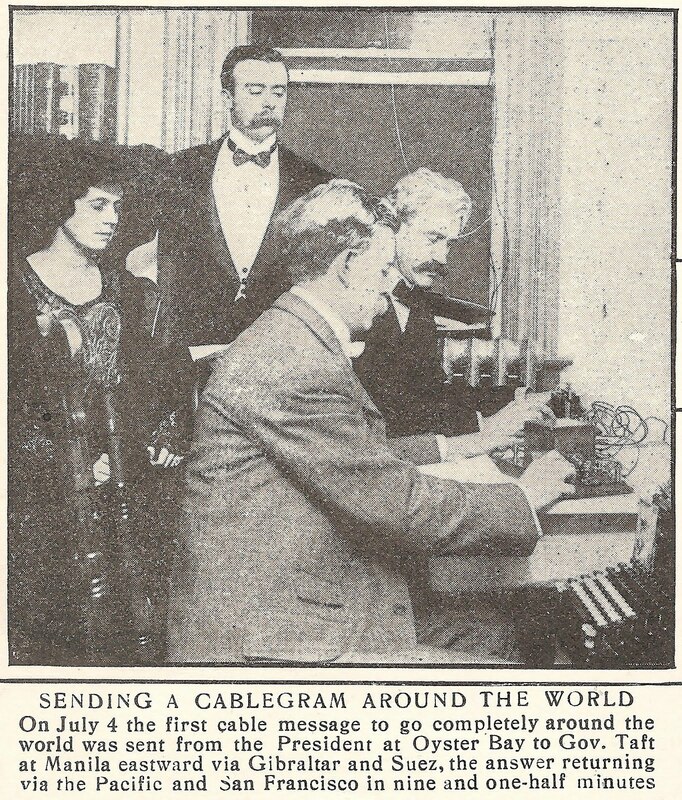 "The cables carried the first message to ever travel around the globe from US President Theodore Roosevelt on July 4, 1903. He wished 'A happy Independence Day to the US, its territories and properties … ' It took nine minutes for the message to travel worldwide. "In 1906 Siemens AG made and laid the section from Guam to Borin Island in the Japanese archipelago. That company also connected Manila to Shanghai by Silvertown. Commercial Pacific Cable later merged with American Telephone and Telegraph (AT&T)."